Filled with grilled veg, cumin-fried black beans and fresh coriander, and baked until bubbling and golden, this Mexican classic is super comforting. Preheat the oven to 200ºC/400ºF/gas 6. Place a griddle pan over a high heat to get smoking hot. Halve and deseed the peppers, then add to the griddle with the corn. Grill for 8 to 10 minutes, or until charred and bar-marked, turning occasionally. Remove to a plate to cool. Meanwhile, heat 1 tablespoon of oil in a medium frying pan over a medium heat. Drain and add the black beans, stir in the cumin and fry for 4 to 5 minutes, or until crisp, stirring occasionally. Once cooled, cut the corn kernels away from the cob and chop the peppers into 1.5cm chunks. Reserving 1 tablespoon of the corn, add to a large bowl with the peppers and black beans. Trim, finely slice and add the spring onions, reserving a small handful to one side. Deseed, finely slice and add the chilli. Pick and add most of the coriander leaves, reserving the stalks. Squeeze in the juice of the lime and season well with sea salt and freshly ground black pepper. Wipe the frying pan clean with kitchen paper, then return to a medium heat with 1 tablespoon of oil. Peel and finely slice the garlic and finely slice the coriander stalks, then add to the pan for 1 minute. Stir in the tomatoes and ½ a tin’s worth of hot water, breaking up the tomatoes with the back of a wooden spoon. Bring to the boil, reduce the heat to medium-low and simmer for 5 minutes, or until thickened and reduced. Season to taste, carefully transfer to a liquidiser and blitz until smooth. 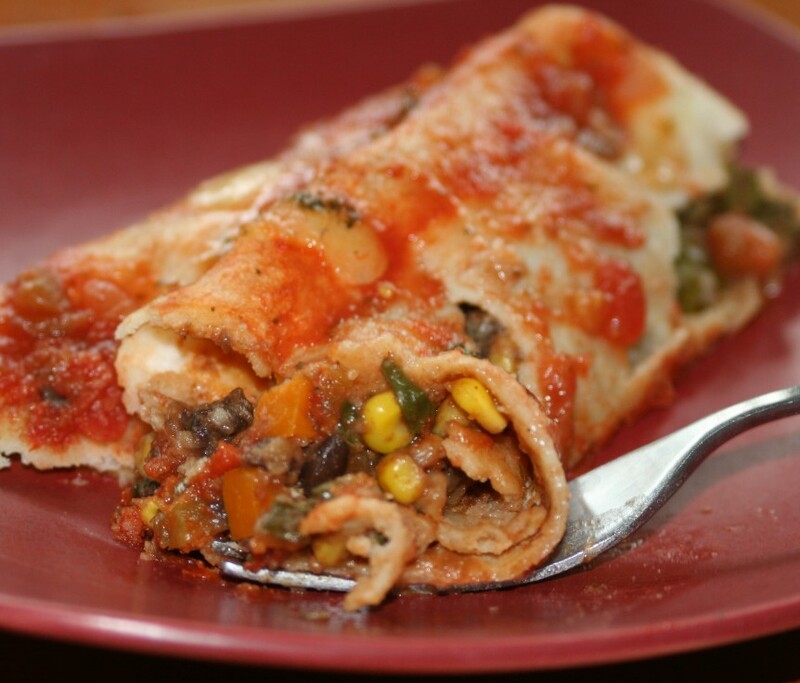 Divide the vegetable mixture between 8 corn tortillas and roll them up. Line them up in a snug-fitting baking dish (roughly 20cm x 30cm), with the scruffy ends tucked underneath. Pour over the tomato sauce, coarsely grate the Cheddar on top and crumble over the feta. Drizzle with a little oil, then pop in the hot oven for 25 minutes, or until bubbling and golden. Serve scattered with the reserved corn, spring onion and coriander leaves. Delicious with a crisp green salad.